The Lagos State Police command has arrested a banker, Nkechinyere Nwajagu, who locked her 11-year-old housemaid, Precious Nwafor without food and travelled to her village for the Yuletide. 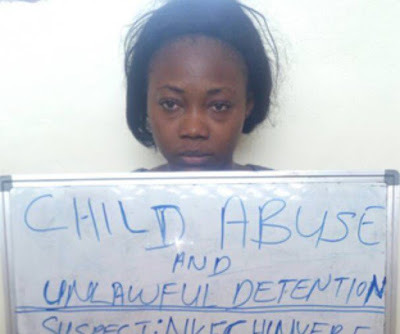 It was gathered that neighbours alerted law enforcement agents when they found the girl locked up in the house at 12 Baderin Street, Mafoluku, Oshodi area of Lagos. The complaint prompted the Commissioner of Police, Lagos State Command, Edgal Imohimi, to lead a team to rescue the girl. Spokesman for the Lagos State Police Command, Chile Oti, who confirmed the arrest, said “the female banker who hails from Ajali in Orumba Local Government Area of Anambra state but resides at 12 Baderin street, Mafoluku Oshodi, reported at Makinde Police Station Oshodi, last night, from where she was taken to the Human Rights Section of Lagos State Command Ikeja.